4. DOES MORALITY DEPEND ON RELIGION? 5.1. Is There a Duty to Help the Starving? 8.2. Is Pleasure All That Matters? 8.3. Are Consequences All That Matter? 8.4. Should We Be Equally Concerned for Everyone? 9. ARE THERE ABSOLUTE MORAL RULES? 11.1. Do Women and Men Think Differently about Ethics? 13. 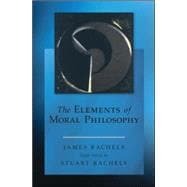 WHAT WOULD A SATISFACTORY MORAL THEORY BE LIKE?